In spite of having eaten some great meals in fine restaurants, most of my food memories were home grown. A person who awakens to the essence of wonderful food being prepared has to realize that someone has gotten up early and is working hard to make the start of the day special. On the flip side, those who return home, starved and weary should count themselves blessed if they open the front door on a cold, miserable day and are buoyed up with comfort-food fragrances. Food aroma can and does make a difference in people's lives...In our home it was, at times, an unwritten invitation to the next family meal. At other times, it was the promise of a favorite food that would be anticipated and savored in a lunchbox meal or packed as sustenance for an extended road trip. Whenever we have moved, I have personally packed and hand-carried my collection of recipes...they are that important to me.The recipes I use are much loved formulas and they are a legacy that should be passed on and and not forgotten. Cooking has been a wonderful adventure for me and so I begin this project of sharing my culinary experiences and love with my mother's Italian Beef recipe. As a sidebar, I will say that I have only tasted restaurant-grade Italian Beef a few times and was always disappointed and critical...if anyone knows what the taste could and should be for something, it is impossible to accept an inferior substitute. This recipe may be doubled. Remove as much fat from meat as possible prior to cooking. In a large, heavy pan, heat oil on med. high heat and add olive oil. When oil is hot, add raw beef and braise both sides until nicely browned. Turn down heat and add enough water to come halfway up the sides of the meat. If using left-over pot roast, omit browning step and put meat in pot with water and continue. Add garlic cloves and salt and pepper (don't overdo seasoning; you can always add more later). Cover pot with lid and simmer for at least 2 hours. Check water level occasionally and add more when necessary. Check meat tenderness with a fork. When the fork can be inserted with little resistance, the meat is ready for slicing. Remove meat to a cutting board and slice meat thinly on the diagonal. Add meat back to pot with enough water added to cover slices. Add sliced peppers and onions. Crush oregano between your fingers and thumb as you sprinkle it over the meat. This is by taste, but don't over do it. Add 1 tsp. Gravy Master (more if desired). Cover pot and continue simmering until peppers and onions are tender. Taste au jus and adjust seasoning as necessary. Slice thick buns and place meat mixture on each. Spoon jus over each sandwich. Don't skimp on the quality of the buns...a light weight bun will become soggy and inedible. You many also use Italian or French bread cut into appropriate lengths and then sliced open. *This wonderful meat dish may be served over fragrant rice. 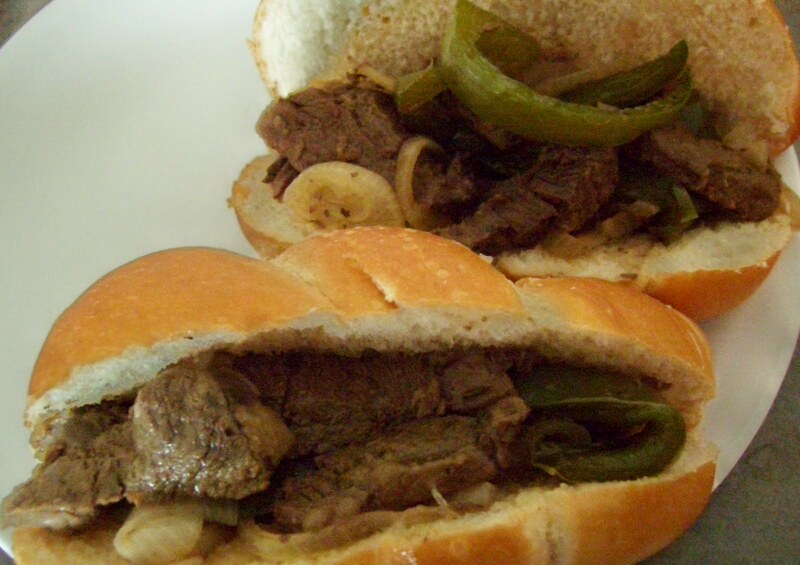 **Italian beef freezes well and also is great as a next-day leftover. When refrigerated, the fat will rise to the top and harden. It should be lifted off and dicarded prior to reheating meat mixture. Unfortunately, some of the herbs will be lost in this process as they will cling to the fat. You will have to add more oregano/pepper by tasting and adjusting. Favorite side dishes: buttered green beans and a tossed salad with Italian dressing.